Filtered OFDM (F-OFDM) applies a filter to the symbols after the IFFT in the transmitter to improve bandwidth while maintaining the orthogonality of the complex symbols. This example implements a transmitter F-OFDM for HDL code generation. 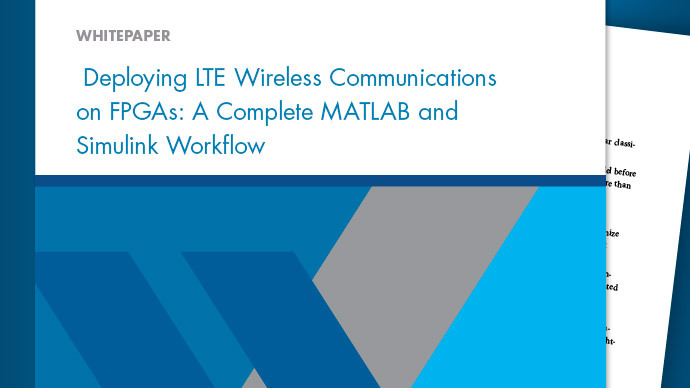 The example shows how to go from a MATLAB® reference model to an HDL-optimized Simulink® model. It includes converting from double to fixed-point types, and minimizing the resource use of the design on an FPGA. Refer to F-OFDM vs OFDM Modulation for comparison between OFDM and F-OFDM waveforms. Set the desired F-OFDM properties. Call the h5gOFDMInfo function to calculate F-OFDM parameters. The method calculates FFT length, cyclic prefix lengths and number of subcarriers. The reference model runs a floating-point F-OFDM system and plots the spectrum. Use the reference model to compare against the fixed-point model that supports HDL code generation. Model the channel by adding noise to the signal. The received signal must be synchronized and aligned. In real situations, the receiver includes symbol synchronization. In this example, the receiver corrects for the shift of the frame by the transmitter filter by . Recover data, calculate BER, and display constellation. The spectrum shows clear improvement of out-of-band radiation of the subband signal, and increase in effective bandwidth. To generate HDL from the model, we need to use fixed-point data type instead of double. For 64-point QAM we need at least 6 bits + 1 sign bit. However, to achieve reasonable BER, we need to increase the input word length. We also need to consider FPGA's limitation. Multipliers in FPGAs have limited input word length. For example, Xilinx's DSP48 has 18*25-bit multiplier. For an optimal design we choose a wordlength so that all multipliers in the FFT and the filter are smaller than 18*25-bit multipliers. In this example, the FFT HDL Optimized block uses the "Divide butterfly outputs by two" option. The input word length is 16 bits. You can run the Simulink model with floating point data by setting WORDLENGTH=-1. However, this mode is not supported for HDL code generation. Set the number of fractional bits to WORDLENGTH - 2 bits to cover -1 <= Symbol <= 1. On the other hand, the required sample rate is calculated by and it is equal to 122.88 Msps for this example. To achieve 122.88 Msps the clock frequency should be at least 135.36 MHz. Set up the model and run. Note that due to the system latency, we need to run the model longer to collect enough data. Model the channel by adding some noise to the signal. Note that the same noise is used as in the reference MATLAB model. Perform symbol synchronization, recover data, calculate BER, and display constellation. The spectrum shows even for fixed point a clear improvement of out-of-band radiation of the subband signal, and increase in effective bandwidth. Therefore to achieve 122.88 Msps sample-rate for this example, the clock frequency must be at least 196.8 MHz. Set the length of the FFT for the filter. The length must be at least 2*FilterLength for frequency domain filtering. However, because it must process the whole OFDM symbol at once use Nfft for FFT length inside the filter. Then, calculate the FFT of the coefficients. Bit-reverse the result since the output of the FFT for the filter is bit-reversed. For fixed-point input data, the output of the FFT inside the filter has a bit-growth = log2(Nfft) = 11 bits. To map most of the multipliers into DSP block in FPGA, limit the input word length. For example if DSP has a 25*18-bit multiplier, the WORDLENGTH must be 14 bits to achieve 25-bits output of the FFT inside the filter. Also, use 18-bit coefficients. The design was synthesized for Xilinx Zynq-7000 (xc7z045-ffg900, speed grade 2) using Vivado. This FPGA has 900 DSP48 slices and therefore the fixed-point version of the design doesn't fit in this device. The HDL Optimized version of the design fits in this chip and achieves a clock frequency of 205.8 MHz which meets the required clock frequency of 196.8 MHz. The design uses 94 DSP48 (10%) and 24 block RAMs (4%). In this example a Simulink fixed-point model was developed and optimized for hardware. The model minimized resource usage by optimizing use of DSP on the FPGA. Comparing the results of the floating-point model with the fixed-point model shows that 16-bit data has a similar bit error rate to the floating-point data.